The salmon season on the fast-flowing water was officially opened in Aberlour, with a crowd of about 200 gathering in the village. Despite the all-time-low catches recorded last year, the anglers amidst those gathered were in high spirits and confident the total will increase this year. Poring whisky in to the Spey Kevin James (left) and Jim Walker (Right) also in photo piper Allan Sinclair. 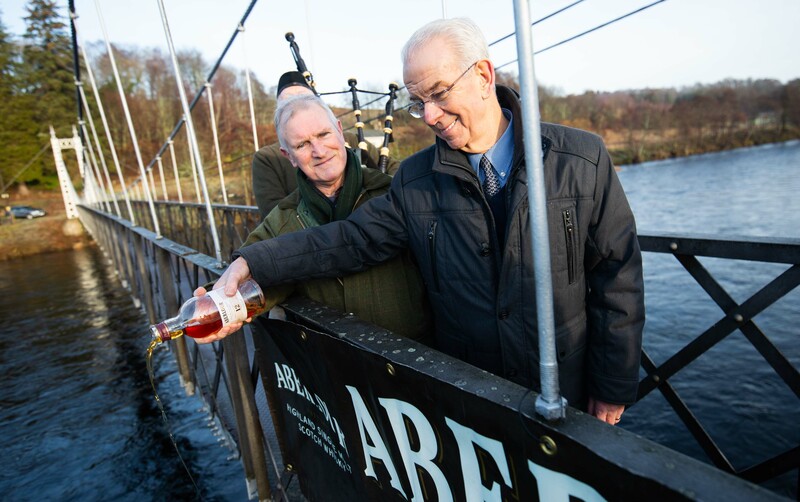 An entire bottle of whisky from Aberlour Distillery was poured into the torrent from the bridge at Alice Littler Park to bless the river by Kevin James, who caught the first fish of last year’s season, and special guest Jim Walker, joint managing director of his family’s shortbread empire. And almost immediately anglers started preparing their lines to try and land their first catch of the season. Mr Walker, who has fished the river since he was four years old, praised the enthusiasm of anglers for keeping the sport alive. He said: “I caught my first salmon when I was nine at Wester Elchies. I still remember it. Unfortunately I don’t get to the river as much as I used to but I want to get back to it. “My father was even keener than me. He would always be up early in the morning, being a baker, but during April and May he would go down to the river first – so some days everybody had to wait for their rolls. “He would normally go back after breakfast and would usually catch something. Launch of the River Spey salmond season at Aberlour. “There are great characters among the gillies and everyone else who works on the river. Last year’s salmon catch on the river was 3,178 – a drop of more than 2,000 om the previous year. The sharp decline was blamed on the exceptionally warm summer, which caused the river’s water levels to drop to its lowest since 1976, and the continuing issue of less fish returning to the river from the sea. 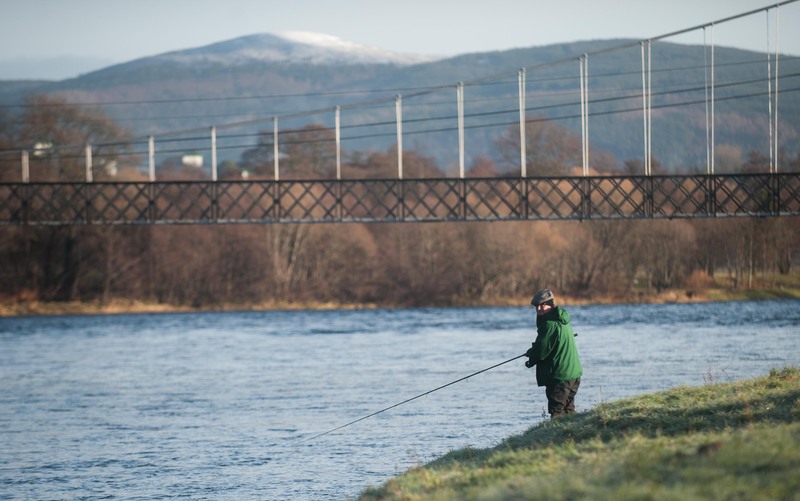 Roger Knight, director of the Spey Fishery Board, said: “There’s always a wonderful atmosphere at the start of the season. James Stokoe, who won the BBC fishing show Earth’s Wildest Waters, was at the riverbank at Turriff to toast the river. The skirl of bagpipes marked the opening with crowds of visitors gathered along the riverbank. Mr Stokoe works as a guide for anglers on the River Tyne and an ambassador for the Atlantic Salmon Trust, Angling Trust and Fishing for Schools projects. He was given the honour of toasting the River Deveron with a dram of 18-year-old Deveron malt whisky. Mr Stokoe also presented the Morison Trophy to Richard Breakall, who landed a 22lb salmon from Muiresk Fishings, and made the first cast of the new season. Richie Miller, director of the Deveron, Bogie and Isla Rivers Charitable Trust said he hoped for a successful season for anglers. Morison Trophy winner Richard Breakell and special guest James Stokoe at the opening of the Deveron fishing season yesterday. 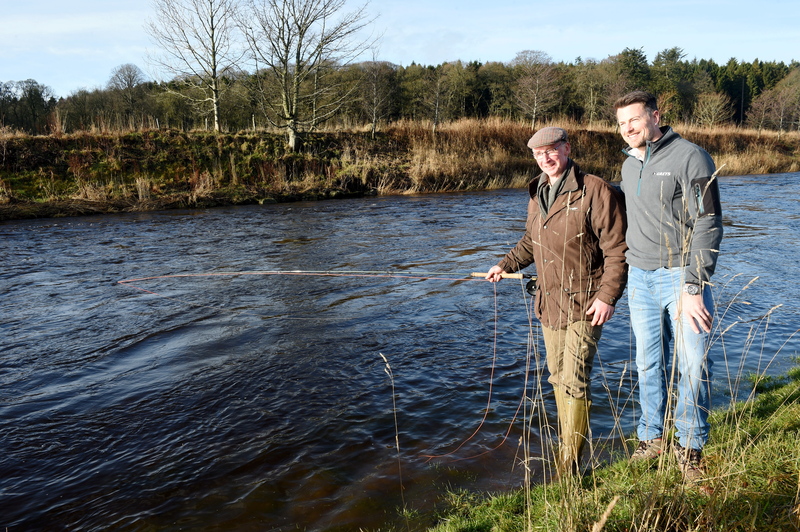 Mr Miller, also director of the River Deveron District Salmon Fishery Board, said: “It’s always good to get the river open after the long winter. “All the anglers are eager to get out there, the river is at a perfect height and there is beautiful weather. “We want a better run of fish coming back to the Scottish coast this year and we also need a good water height to get them into the river. Mr Miller took Mr Stokoe out fishing on the Deveron once his ceremonial duties were complete. It was the first time the angler had cast his line at the north-east beauty spot. Mr Miller said: “He’s never fished on the River Deveron before, but he was excited to come up because he knew a lot about the river.